Promobot to sell robots worth $56 million to U.S.
Skolkovo resident robot-maker Promobot has landed a contract worth $56 million with a U.S. company, the Perm-based robotics company announced Tuesday. 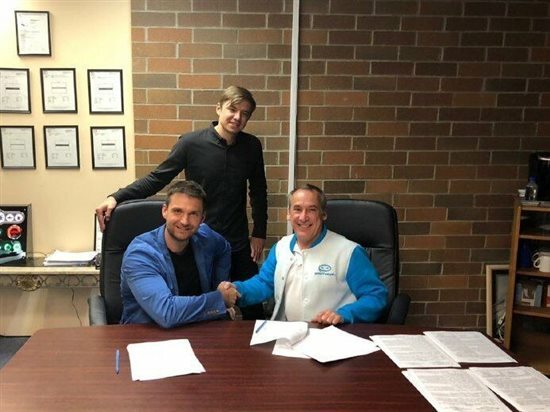 Promobot's Alexei Yuzhakov (left) shakes hands on the deal with USLG's Paul Spivak as Promobot co-founder Oleg Kivokurtsev looks on. Photo: Promobot. Under the five-year contract, US Lighting Group, a major producer of LED bulbs, gains the exclusive rights (for $600,000) to sell Promobot’s friendly, talking promotional robots in the U.S., and has put down an advance order for more than 2,000 robots, worth $56 million. “This is one of the biggest deals in the history of service robotics so far,” said Alexei Yuzhakov, chairman of the board of directors of Promobot, who outlined his plans for U.S. expansion in an interview with Sk.ru earlier this year. “We are, of course, delighted to work with such a strong American partner, and can’t wait to bring our robots to the U.S. Now we can really talk about Promobot’s fully-fledged presence on the U.S. market,” he said. Promobot robots have already been sold to 18 countries around the world, where they work as promoters, museum guides, concierges, bank consultants and administrators. The robots can be programmed to speak multiple languages, and can recognise people with whom they have previously interacted. Promobot robots can scan and issue security passes, and accept and print bank cards, among other functions. Photo: Sk.ru. Promobot and USLG have also agreed to open a service centre and production line of electronics and components for the robots in the U.S. The main office of USLG in Cleveland, Ohio is currently being considered as the site for those facilities. “We see enormous potential for this product, and are happy to become Promobot’s exclusive distributor in the U.S.,” said Paul Spivak, CEO of Intellitronix Corp., a subsidiary of USLG. Promobot will send 75 robots to the U.S. this year, and by 2022 will be supplying 100 robots per month to the country, Vedomosti reported Tuesday. The Russian company’s priority right now is to increase production, and it is currently seeking investors in Russia and abroad – including in Silicon Valley – to that end, the newspaper cited Yuzhakov as saying. Currently, Promobot robots are made entirely in Perm. 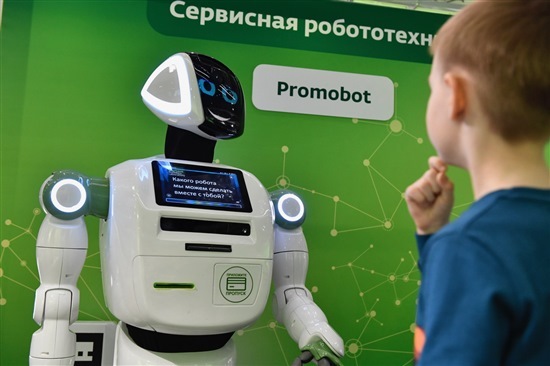 “Promobot is one of Skolkovo’s leading robotics companies,” said Konstantin Parshin, head of the Skolkovo Foundation’s IT cluster. “The company is a brilliant example of the renaissance of Russian service robotics, and examples of its successful integration around the world are further proof of this,” he added.